Why did you chose to join the RNLI? What do you see as your greatest quality? 1. I joined 27 years ago to be part of a great team and organisation, to help anyone in distress when no one else can help. 2. My qualities are I’m calm in stressful situations and I’m energetic and passionate about the work I do for the RNLI. 1. I wanted to learn and develop in a new area I wasn’t experienced in and to help people. 2. I would always say I am willing to get stuck in and do things outside of my comfort zone. It is really important to leave your ego behind when you’re on the boat and I hope I do that! 1. I joined because it gives me the opportunity to help people in need and to use my medical skills learned as a volunteer medic in the Army Reserves. 2. I would say that my ability to deal with stressful situations calmly is very helpful. 1. I decided to join the RNLI as a volunteer in Portsmouth as when I was a child we used to go to the station with my grandparents on a Friday evening and have a fish and chip supper. Grandad used to lift me up so I could see the boats through the window. Several years later I occasionally used to see the boat on shouts in rough weather near where I used to go fishing and thought that it looked like fun. I applied several times on the website over 2 years and nothing happened, I then rocked up at the station one day and told the Local Operations Manager and he enrolled me in 2007 from there I have never looked back. I then started doing shifts at Chiswick in 2009, joined the flood team in 2009 and my employed role in 2017. 2. I feel that I have learnt a lot from the RNLI and my decision making and leadership under pressure is reflective of our training and support. 1. I have always wanted to be on the crew since going to Aldeburgh when I was 5. I can clearly remember looking at the huge trailer launched Mersey which appears as if it had only just been built as it was so well maintained. At school I rowed on the river and had the misfortune to need to be pulled out by the lifeboat when I was 14 when the rowing boat I was in hit Barnes Bridge. I applied to join the crew as soon as I was 18. 2. I’m calm under pressure and work methodically in a chaotic environment. 1. 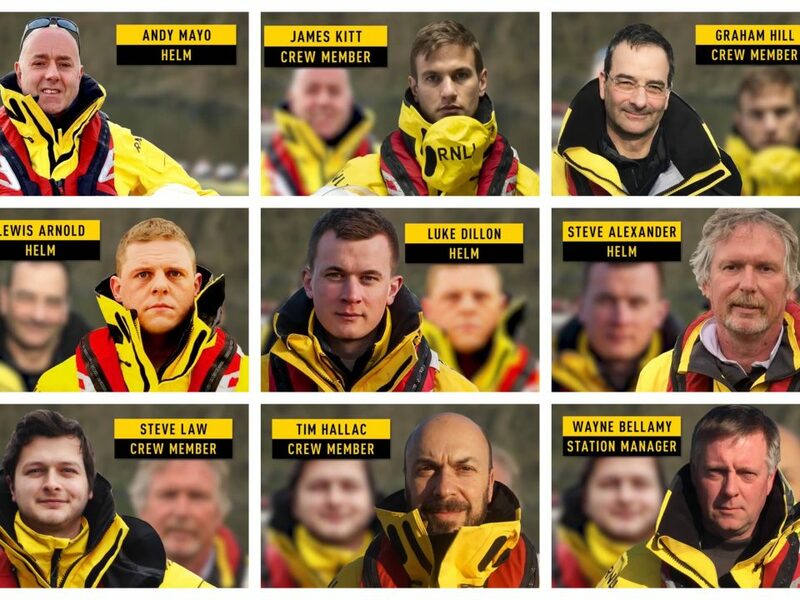 I had wanted to join the RNLI ever since I watched a documentary about the Penlee disaster. 2. I have no ‘great’ qualities and it helps that I’m not vain enough to think that I do. A lifeboat is all about the team and nothing about the individual. 1. Loads of different reasons, pride of being part of something, the skills you gain, putting myself in challenging situations and learning to overcome them. But the original trigger was nearly losing a friend at a young age, feeling helpless in that moment, and wanting to feel prepared next time someone’s life was at risk. Being RNLI crew has given me that. 2. Being crew at Chiswick is 1% rescuing people, 19% training, and 80% waiting on station for the bell to ring – patience is a key quality needed. 1. The opportunity to do something completely different from my day job. 2. Commitment, enthusiasm and good team player. 1. I had volunteered with the coast guard in Canada before moving to the UK, I tried to join then but nearest station was Brighton. When I heard about the lifeboat starting on the Thames, I expressed an interest in joining as a volunteer, one thing led to another and I joined as staff, 3 months before we started operating in Jan’02. 2. Difficult to self-assess that one. Probably being Canadian helps bit- reflective of London’s cultural diversity and naturally patient.